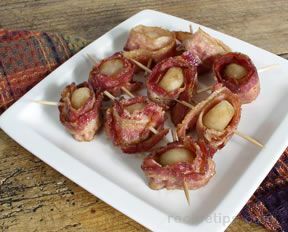 Wrap crunchy water chestnuts in the smoky sweetness of bacon to make an easy hors d' oeuvre for any function. 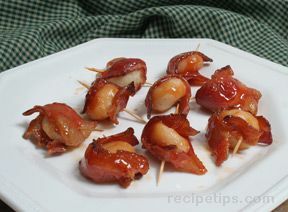 Mix sugar and soy sauce before marinating chestnuts in the mixture for 30 minutes. 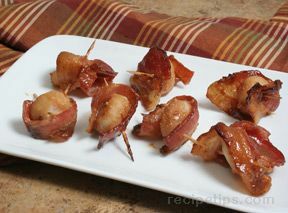 Wrap each chestnut with Â½ strip of bacon and secure with a toothpick. 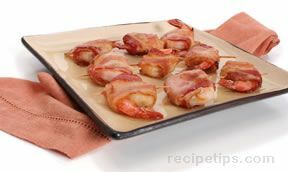 Place a rack in a baking pan and place the bacon-wrapped chestnuts on rack. Bake 20 minutes. Remove from oven and drain off excess drippings. Serve immediately or refrigerate until serving. Before serving, reheat in 350° F. oven for 5 to 10 minutes.